Boneshaker has been on my reading list for a fair while now, picked up as part of a geeky bundle. I was definitely looking forward to this one though, as it combines one of my favourite sub-genres, steampunk, with something looking horror elements. I was keen to see how it would pan out. In an alternate history where the Civil War has been raging for two decades, an attempt to mine through the frozen Klondike for gold leads to disaster when the massive drill known as the Boneshaker destroys huge parts of downtown Seattle and releases a previously subterranean gas that turns those unfortunate to breathe it into the living dead. Sixteen years later, the worst affected parts of the city have been sealed off by walls, and the widow and son of the Boneshaker's inventor, Leviticus Blue, are trying to make a living whilst dealing with the ignominy of their relative's devastating actions. When Ezekiel makes his way into the sealed off city determined to find proof of his father's lack of malicious intent, Briar must find a way through the living dead and heavily armed criminals still living in the ravaged city in order to bring her son back. Boneshaker was something of a slow burner for me. While I absolutely loved Briar and her sections trying to reach her son whilst regretting all the things that she never felt ready to tell him about his father, I was less keen on Zeke's sections. While there's nothing outright wrong about the way that he's written, I just find his kind of character irritating. An ounce of prevention being worth a pound of cure and all, it's more interesting watching Briar's more considered approach as opposed to Zeke's "I have maps and a mask, I have no more need for preparation" plan of attack, which inevitably leads to a lot of blind panic. He does get better by the end though, so it's worth it to plough through his sections of blundering in the middle of the book. 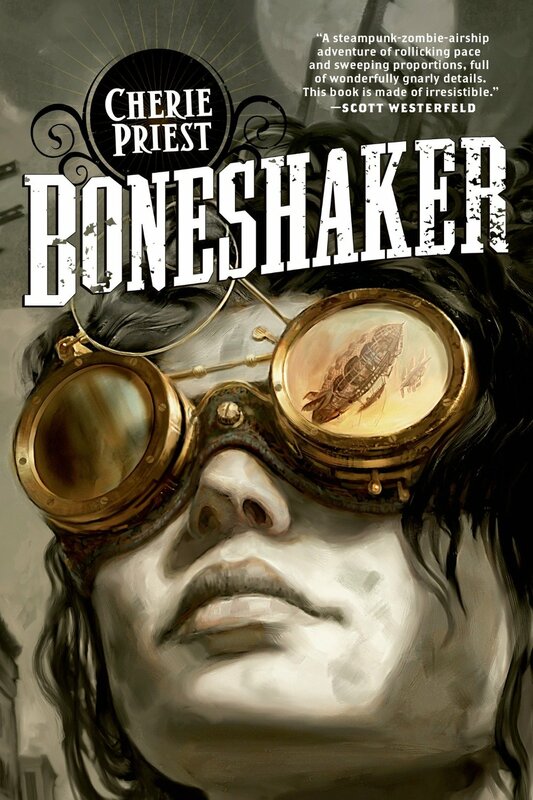 And Boneshaker is definitely worth finishing. Keeping in mind that it's alternate history and thus there are some massive creative liberties that have been taken with regards to historical accuracy, you can really tell that Priest is enthusiastic about the period and tries to keep as much historical flavour as possible within her re-imagined chronology. It makes the world feel a lot more grounded and realistic than a lot of other fantasy/science-fiction books, even compared to series where comparatively little is different to the real world. I can't really think of many people that I couldn't recommend this to.